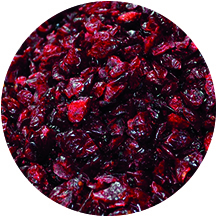 We have a partnership with ATOKA, supplier of high quality conventional and organic dried cranberries both whole and powdered. Atoka has a good reputation for the quality of the product. Powerful antioxidants are present in large quantities in cranberries. Some evidence suggests that the polyphenols in cranberries may reduce the risk of cardiovascular disease. This product is rich in fibre and vitamin C.
Cranberries also contain vitamin K, manganese and phytonutrients. In meals, deserts and yogurts. Rhumveld Winter & Konijn B.V.